Fresh, Healthy Gourmet Meats with Artisan Cheeses and Cuban Fresh Baked Bread made to order Everyday…. Fresh tastes, quick service and a welcoming friendly atmosphere where they can relax over a leisurely lunch. There are others that just like to take it to go, while receiving fast and friendly customer service. Moxie's Too offers excellent service with a smile and a unique touch that’s our own. You’ll see it in our item selection, service and our faces. You’ll also see it in our food, with premium ingredients like eye of the round roast beef, fresh turkey and ham assorted cheeses. Our selection of fresh Cuban bread include sliced breads wheat, rye,Pumpernickel , and white). We provide a variety of sandwiches. You can find items such as sandwiches, salads, pasta, soups, and we also provide catering for any event that you may be hosting. For more information on our catering menu please call to 813-882-4499. Moxie's Too Deli and Cafe has been around since 1989. The sandwich that made Tampa famous! A huge 12 inches of crusty Cuban Bread, packed with Ham, Genoa Salami, Pepperoni, Provolone & American Cheeses, cucumbers, Lettuce, Tomato, Onion, Black Olives, mayo, mustard, & a shot of oil & vinegar! Everything but the kitchen Sink! 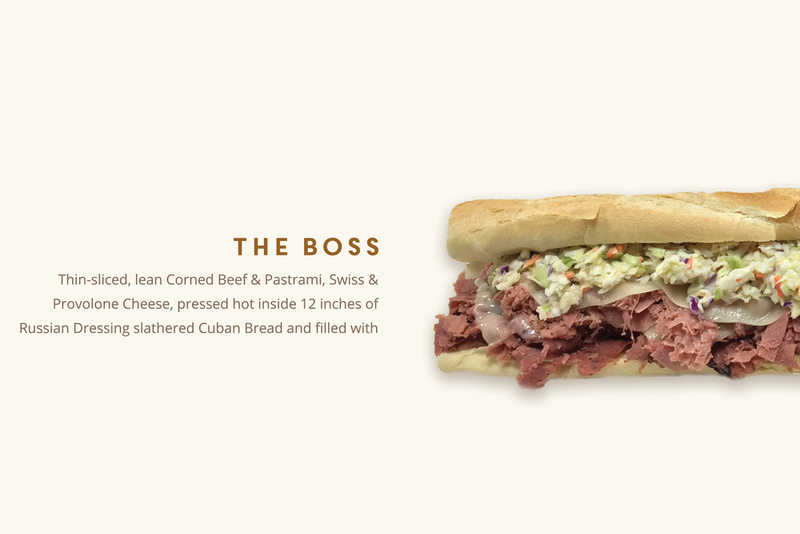 Thin-sliced, lean Corned Beef & Pastrami, Swiss & Provolone Cheese, pressed hot inside 12 inches of Russian Dressing slathered Cuban Bread and filled with our yummy Cole Slaw! Ham, Turkey, Roast Beef & Swiss Cheese, piled high between three slabs of bread, & trimmed your way! Enough for now & later! The one and only! Pressed Hot, or cold if you like, and trimmed the way you like, on the best Cuban Bread in Tampa! Our delicious marinated Mojo Pork, served on Cuban Bread with Swiss Cheese and all trimmings! Our wonderful Cuban, served on a Sweet, Soft, Media Noche’ roll, with all the trimmings! Our hearty & savory Cuban-Style Black Beans, served over Yellow Valencia Rice, with buttered Cuban Bread! Stuffed full of Ham, Genoa Salami, Pepperoni, Provolone, & American Cheeses, with the works….mayo, mustard, lettuce, tomato, onion, cukes, black olives, and vinegar & oil! The “Nawlins” favorite, with a Tampa Twist! We make ours with Cappicola, Genoa Salami, & Provolone, with our famous home-made Olive Salad filling! Pressed hot and delicious! Spicey Cappicola, Genoa Salami, Pepperoni & Provolone, mayo, mustard, vinegar & oil, with all your favorite trimmings! Delicious Ham, Turkey Breast, Genoa Salami, Pepperoni, Provolone & American Cheese, mayo, mustard, & dragged through the garden and hosed down with Moxie’s Oil & Vinegar! Just like it says! Italian style Meatballs, Simmered In our home-made sauce, & topped with Provolone and Parmesean Cheeses! Real Steak, Bell Peppers & Onion, & melted Provolone, pressed inside Cuban Bread! Thinly sliced Roast Beef, seasoned with Garlic, & topped with melted Provolone Cheese. Pressed and served with your choice of trims! Crusty Cuban Bread, stuffed with lean Roast Beef, sauteed Onions, Bell Peppers, & mushrooms, topped with melted American Cheese! Trimmed your way! Thin-sliced, tender Roast Beef, Bermuda Onions, and a “Shmear” of Horseradish, pressed hot on Cuban, and stuffed with our home-made Slaw! Thinly sliced Roast Beef topped with an amazing Tomato-Bell pepper sauce & melted Provolone Cheese, pressed, with your choice of trimmings! A real cyclone of Turkey Breast, Ham, Roast Beef, Bacon & Provolone Cheese, pressed hot on Cuban & dragged through the garden. Cuban Bread packed with Roast Beef, Turkey Breast, Swiss Cheese & tangy Russian Dressing. We press it hot , then load it with our delicious Slaw! Grilled Chicken, Bell Peppers & Onions, and melted Provolone Cheese, pressed inside Crusty Cuban Bread. Ok, ready? Ham, Turkey, Roast Beef, melted Provolone Cheese, pressed hot on Cuban, & loaded with Cole Slaw!! Crusty Cuban Bread, Grilled Chicken & melted Provolone, pressed hot and loaded with Slaw! Dancing is optional. A real Vienna Beef Hot Dog, including mustard, relish, onions, tomatoes, cukes, sport peppers, dill spear, and celery salt! Or, like we call it… Dog Food! It’s the most delicious liverwurst! Add cheese, and whatever trims you like! Woof! A Vienna Beef Dog, loaded with our home-made Cole Slaw! A wonderful combo of Turkey Breast & melted Swiss, pressed hot on Cuban Bread, & topped with our home-made Cole Slaw! Cuban Bread, packed with Turkey Breast, Bacon, Cheddar & real Bleu Cheese! We press it hot & crunchy! A Moxie’s Too! tradition! Turkey, Bacon, Swiss, mayo, Lettuce & Tomato, pressed inside Cuban Bread! A tender, flakey Croissant, with layers of Turkey Breast, your choice of cheese & trimmings. Served hot or cold, this sandwich is scrumptious! If you’re “loser”, this is sandwich is for you! Turkey, mustard, pickles, lettuce & Tomatoes, pressed inside Cuban. Just think, Bacon, Turkey, Cheddar, and real crumbled Bleu Cheese, served on Pump, with mayo & your choice of trimmings! Mesquite Grilled chicken, Cheddar Cheese & all the trimmings, with Ranch Dressing, wrapped in a Chile Tortilla! Spicy Beef & Lamb Gyro, stuffed into soft Pita Bread, with tomatoes, onions, cukes & just the right amount of Tzatiki Sauce! Grilled chicken, stuffed into soft Pita Bread, with tomatoes, onions, cukes & just the right amount of Tzatziki Sauce! Mesquite chicken, Cheddar Cheese, Black Beans, Yellow Rice, Lettuce, Tomato, Onion, Cukes, Salsa & Ranch Dressing, all twisted up in a Chile Wrap! Ole! A Southwest Veggi-Burger, Cheddar Cheese, all the veggies & Ranch Dressing rolled into a Chile Tortilla! Mesquite Grilled chicken, Lettuce, Tomato, Onion & Cukes, drizzled with Ranch or Caesar, then folded into fluffy Pita! Steak, Provolone Cheese, Lettuce, Tomato, Onion & Cukes, with a shot of Caesar & in a Chile Wrap! Absolutely the best Tuna around! Served with your choice of wrap and trimmings! Grilled chicken, Romaine Lettuce, Tomato, Onion, Cukes & Provolone in a Chile Wrap, with Caesar Dressing! Our secret recipe! A devilishly delicious Egg Salad, served in a wrap, and trimmed your way! Our Mesquite grilled chicken, Hummus, and crisp veggies wrapped up in a Chile Tortilla! Our tropical Chicken Salad, served in a wrap, and trimmed you way! Our secret recipe! A devilishly delicious Egg Salad, served on your choice of bread, with your favorite trimmings! Absolutely the best Tuna sandwich in town, guaranteed! Served with your choice of trimmings, on your choice of bread! All white meat chicken, in our own tropical blend of flavors, served on your choice of bread, with your choice of trimmings! Mmmm! A gooey meltdown of Swiss, Cheddar, Provolone, & American Cheese, with Cukes, Bell Peppers, Black Olives, Lettuce, Tomato & Onion, pressed inside crunchy Cuban Bread, with mayo, mustard, Oil & Vinegar! Soft Pita, spread with our home-made Hummus, dragged through the garden, with a squirt of Tahini! Thinly sliced, lean Corned Beef piled between slabs of toasted Rye. Tangy sauerkraut, Russian Dressing, & melted Swiss Cheese will make your mouth water! Slabs of toasted Rye, slatherered with Brown Mustard & piled with spicy Pastrami, tangy Swiss, & all your favorite trimmings! Pressed hot & delicious! Crusty Cuban, jammed with lean Corned Beef, brown mustard & melted Provolone. We squash it hot, then load it full of Cole Slaw! Steve’s favorite! Thinly sliced Corned Beef, tangy kraut, brown mustard, and melted Swiss, packed inside Cuban and pressed! Crisp garden greens, topped off with julienne of Ham, Turkey, Genoa Salami, Provolone & American Cheese, & a hard-boiled egg. Fresh garden goodies, with onions, kalamata Olives, Pepperoncini, & Feta Cheese, with a hefty scoop of Potato Salad! Crisp garden greens served with Kalamata Olives, Feta Cheese, Onions, Pepperoncini, and our spicy Gyro Meat! Crisp garden greens served with Provolone Cheese and our tender Steak! A Garden Salad with scoops of Tuna, Egg, & Chicken Salad on top! Tender Baby Spinach leaves & other goodies, topped with Provolone Cheese, Bacon, & chopped Egg! A hefty scoop of our delicious Tuna Salad, served on a Garden Salad! A hefty scoop of our homemade Chicken Salad, on a bed of our garden goodies! Crisp Garden Salad, topped with a hefty scoop of our delicious Voodoo Egg Salad! Crisp Roamaine Lettuce and other goodies, topped with tangy Parmesean and crunchy Croutons! Above, with our Mesquite-Grilled Chicken Breast! Crisp Garden Salad, topped with taste-budtiantalizing Buffalo-Style Chicken! Smokin! Your basic Salad, full of crisp and delicious garden goodies! Your basic Salad, loaded with delicious Cheddar, Provolone, Swiss, & American Cheeses! Our Breakfast Sandwiches are served on your choice of Cuban, White, Wheat, Rye, Pump, Pita, or a flaky Croissant. 2 Eggs, Cheese, Ham, & Bacon. Bell pepper, Black Olive, Onion, and Tomato omelet pressed inside buttered Cuban Bread, with cheese! Egg, Gyro Meat, & Feta Cheese, with Tomatoes, Onions, and Cukes, pressed inside buttered Cuban Bread! Egg, Steak, & Provolone Cheese pressed inside buttered Cuban Bread! Melted Provolone & Swiss, pressed on buttered Cuban Bread! All Omelets are made with 3 eggs. Your choice of cheese. Egg Whites are extra. Bell Peppers, Tomatoes, Onions, Black Olives, & Cheese! With Gyro Meat, Feta, Tomato & Onion! Spinach, Tomato, Onion, & Cheese! Just what it says, a short of Cuban Coffee, then steamed milk. Most people have theirs sweet, so ask for 1 or 2 spoons of sugar! A dark, Italian Roast Coffee, extracted under high pressure. Our delicious Cappuccino or Latter, with a caramel "Kiss"! Our Cappuccino or Latte, with a nutty hint of Almond! Smooth Cappuccino or Latte, with Chocolate-Mint twist! Wake up luxuriously with our delicious vanilla, chocolate and Hazelnut Cappuccino. Our delicious Cappuccino or Latte, with a Brown sugar caramel and vanilla flavor. Now serving Seattle's best coffees! Gourmet coffee at Moxie's Too! We're amazing hug? We are the friendliest and delivery most caring sandwich near Tampa Airport area.